I had a million things to do yesterday: write a new course proposal, rework an old book proposal, write memos and evaluations (the endless activities of a department chair), work on my digital exhibition of the Great Salem Fire of 1914, finish my seasonal closet turnover (alway a huge project, unfortunately), laundry, cleaning, etc…but for some reason I lay on the couch and read a book about purple—a color I don’t even like—for a good part of the day. To be more precise, the book was about mauve, the first artificial dye, invented quite by accident in 1856 by a teenaged chemical student named William Perkin. I’ve had Simon Garfield‘s Mauve: How One Man Invented a Color that Changed the World in my library for quite a while, but I never really opened it up until yesterday. And once I did, much of the day slipped away, as Garfield drew me into the story of Perkin’s accidental discovery and its colorful consequences. While working on a malaria treatment derived from the synthesis of quinine from coal tar, Perkin wound up with an appealing purplish sediment in the bottom of his beaker: this became mauveine, the first chemically-produced dye. Mauveine, and the process by which it was produced, led to a world of industrial applications: more standardized and intense colors for the textile industry, and advances in the diverse fields of medicine, perfumery, explosive, food and photography. Even before the color made its formal debut at the London International Exhibition in 1862 it caught the eyes of two extremely influential ladies, Queen Victoria and Empress Eugénie, the fashionable wife of Napoleon III. The Queen wore a gown of “rich mauve velvet” (according to the London Illustrated News) to her daughter Victoria’s wedding to Prince Fredrick William in 1858 and later judged it appropriate for “half-mourning”, while the Empress (apparently the Elizabeth Taylor of her day) wore “Perkin’s purple” often, as it was said to match her eyes. The decade of the 1860s was deemed the “mauve decade” by the popular press, characterized and colored by an outbreak of what Punch called “mauve measles”. Mauve gowns and upholstery fringe, 1860s-1870s, Victoria & Albert Museum, London. Garfield’s book got me thinking about other hue histories: I read Amy Butler Greenfield’s A Perfect Red. Empire, Espionage, and the Quest for the Color of Desire a few years ago while prepping for my Expansion of Europe seminar: its focus on the American cochineal is a perfect illustration of early modern colonial competition. There are several books on indigo, also a sought-after commodity (the one below looks good), and apparently you can read about the histories of all the colors in Victoria Finlay’s Color: A Natural History of the Pallette, including ochre, black and brown, white, orange, yellow and green. I might use one of these books in a class one day (when I am relieved of my administrative obligations): commodities are a good way to focus in history surveys: students like things that are tangible, material, and accessible–and they also like narratives. Commodity history has been dominated by food and drink in the past few decades (COD and the making of the modern world, the POTATO and the making of the modern world, RUM and the making of the modern world, SALT and the making of the modern world, PEPPER and the making of the modern world, BANANAS and the making of the modern world, etc…..) but now I think we can add some color. This entry was posted on Monday, October 7th, 2013 at 6:21 am	and tagged with 19th century, books, England, Fashion, Teaching and posted in Culture, History. You can follow any responses to this entry through the RSS 2.0 feed. As always, a wonderful story from you, here about color! 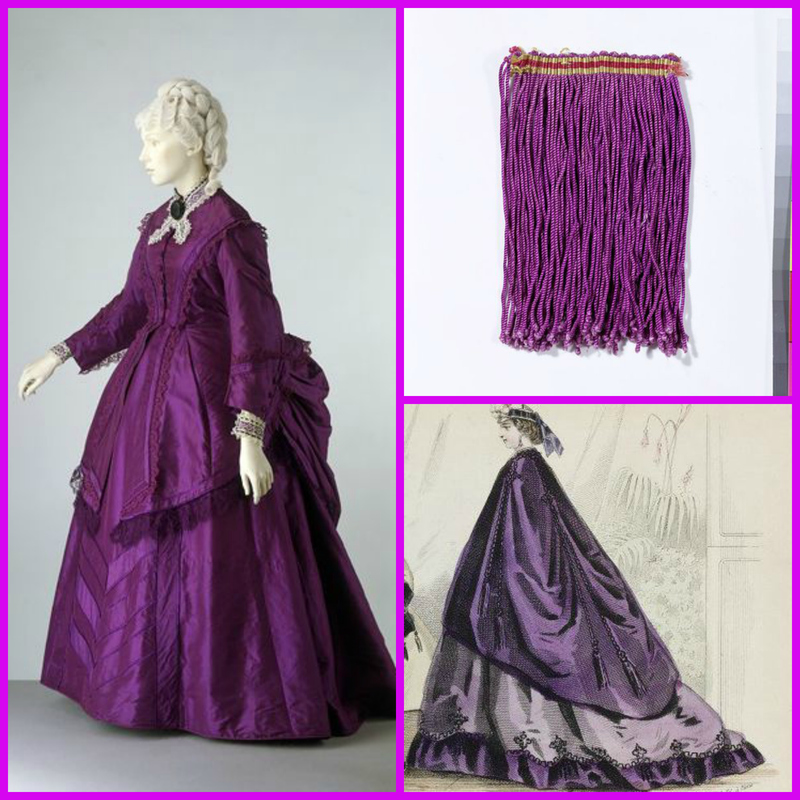 Mary Lincoln was also a fan of purple…same time frame, same reasons…clothing and choice for White House china. . . I worked with these objects at the Smithsonian Institution. That’s right, Melinda–I remember your comments from my white house china post. Thanks so much for adding this–it is the same color and era exactly. A transatlantic craze for mauve! Actually, I was going to bring America in because of an old book I found called The Mauve Decade about NYC in the 1890s–but that was so much later it didn’t quite fit. Mauve is just pink trying to be purple. One doesn’t think of color as a commodity anymore. It’s an interesting concept to reproach. No, colors aren’t commodities anymore; I guess thanks to Perkin! Thank you for this post about a colour which is truly beautiful and the symbol of spirituality! Mauve is a French word which means ‘mallow’ (a mauve flower of course) whereas purple comes from the name of shell from which the phoenicians made a natural, reddish, dye quite a few centuries before the industrial ‘mauve’. There is much to be said about colours, imagine life without them! I sometimes do–I’ve got a couple of color-blind friends!